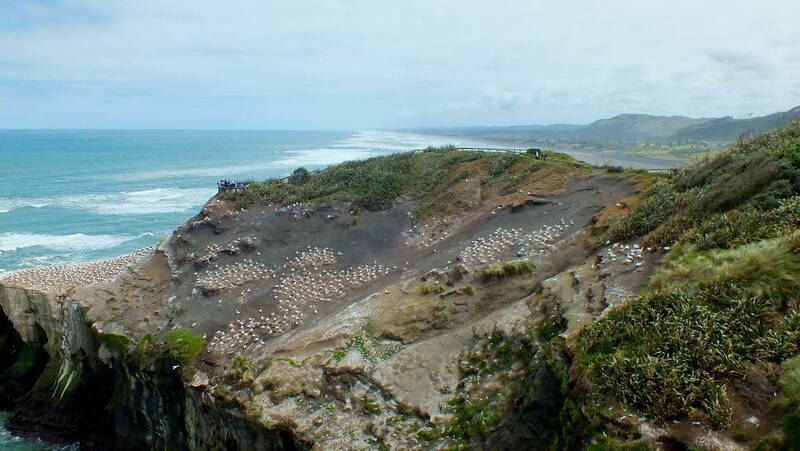 On our first full day in New Zealand, Bob and I headed north from Karekare to the well known Gannet colony at Muriwai. 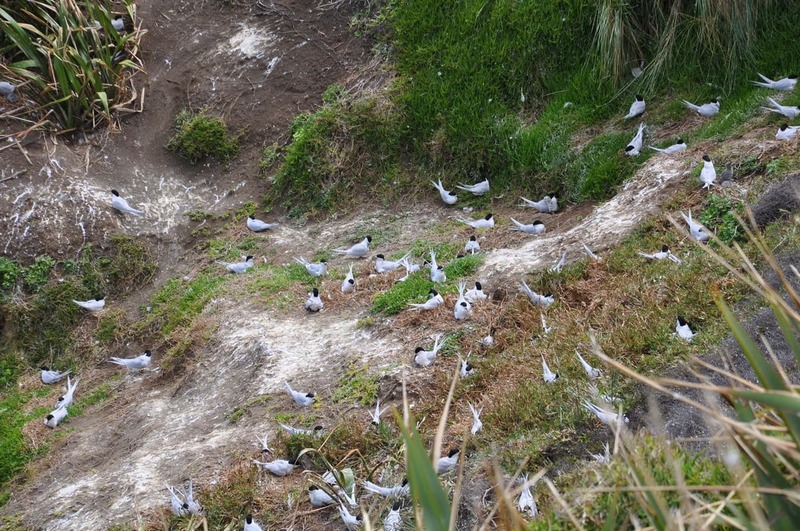 We were very pleased to find a significant colony of White-fronted Terns also sharing the headland at Otakamiro Point. 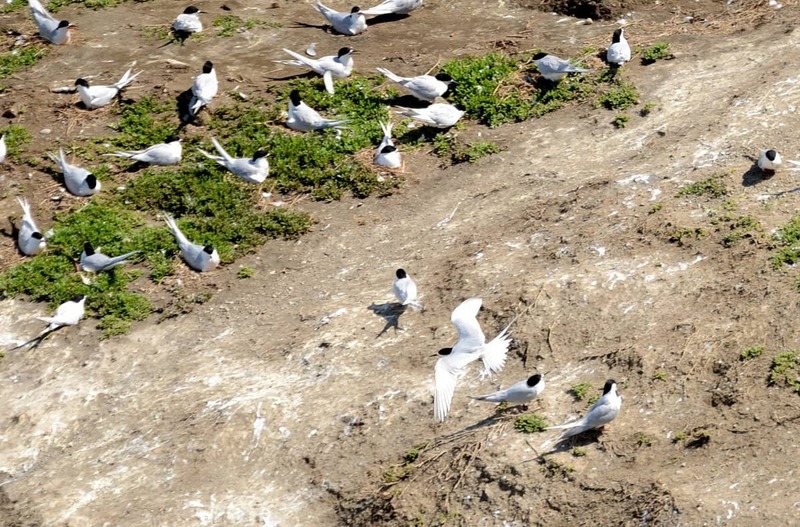 Bob and I could look down on the nesting colony of White-fronted Terns. 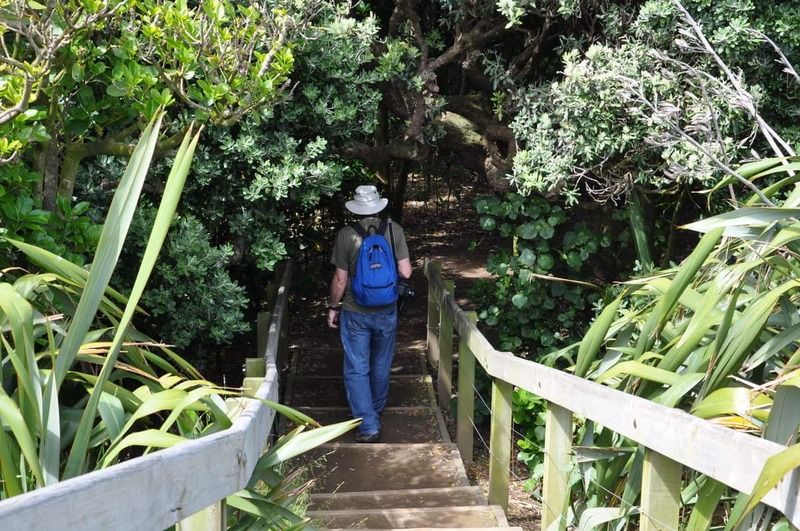 through a small patch of coastal forest where Pohutukawa grow. Later during our trip, we would see these trees in full bloom. 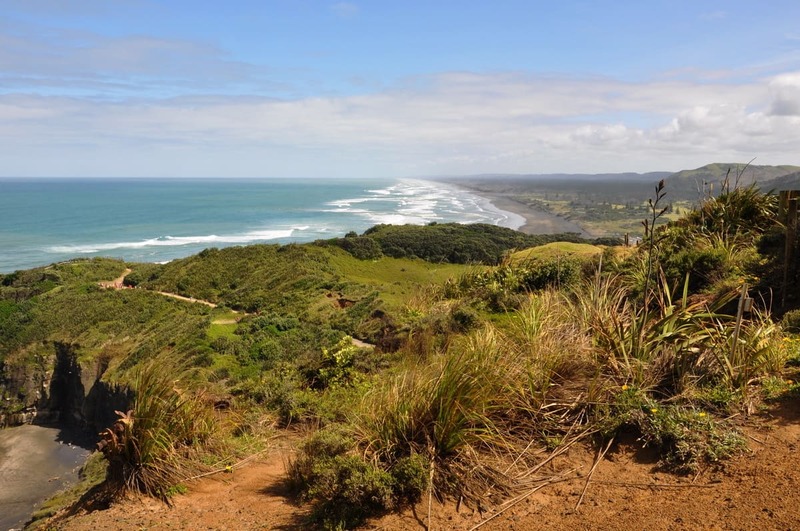 The shaded trail soon gave way to rolling sand dunes where Pingao, a coastal sedge, and Spinifex, a member of the grass family, have been planted to help stabilize the dunes. 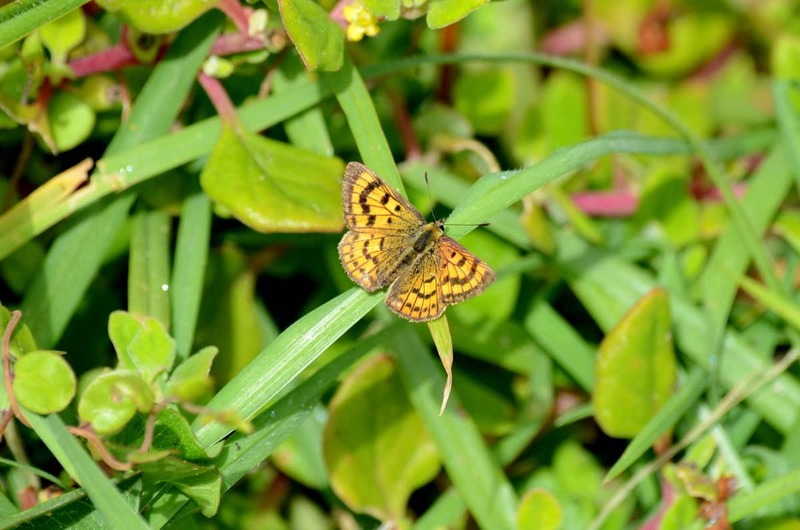 It was there that we caught sight of a pretty orange butterfly, Rauparaha’s Copper. 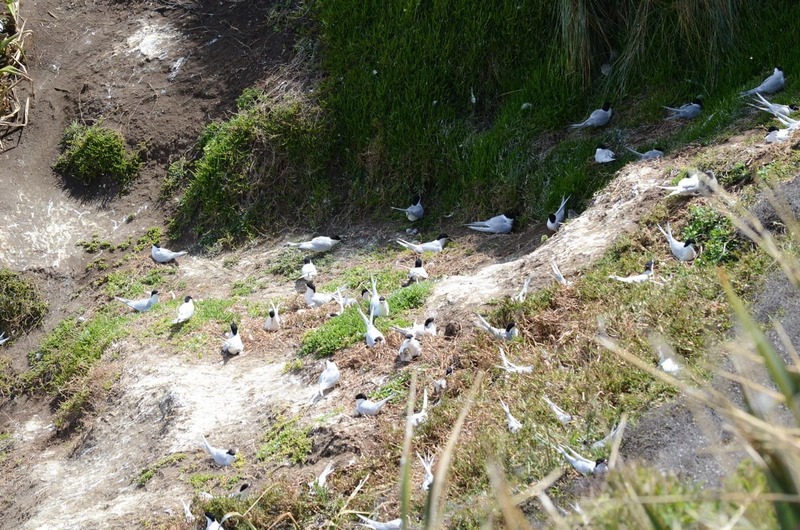 we turned our attentions to a multitude of Terns that were noisily occupying a large sheltered depression at a corner of the windswept cliffs. 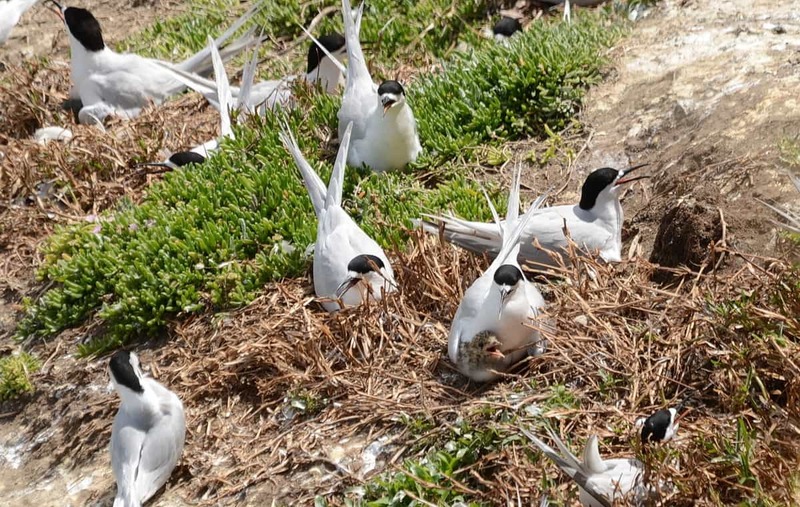 White-fronted Terns had claimed the spot for their nesting location. 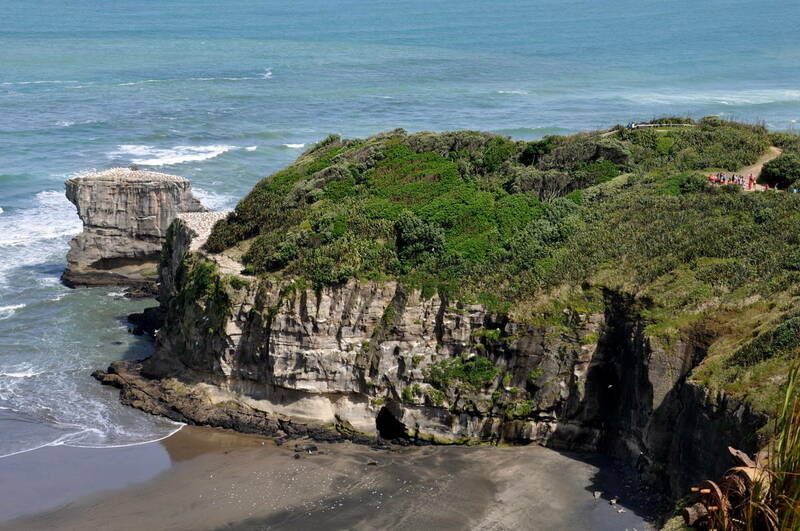 The hollow is modestly protected from the elements by coastal vegetation that has gained a foothold on the exposed lava. 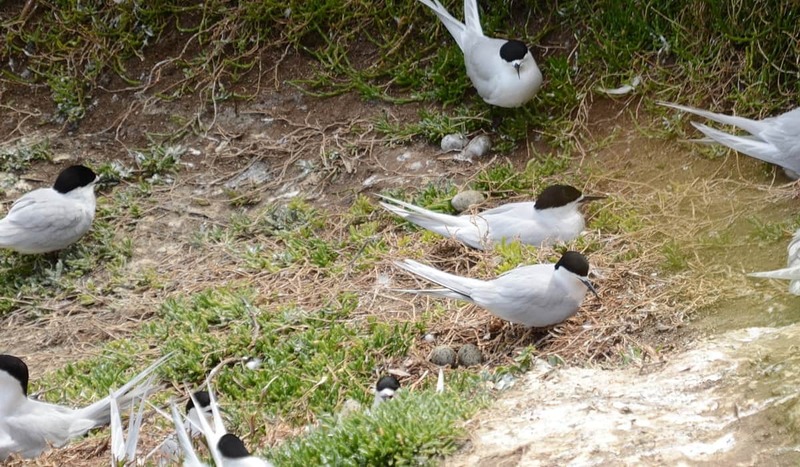 Despite our distance from the colony of White-fronted Terns, we were able to pick out several nesting pairs with recently-hatched chicks in their nests. 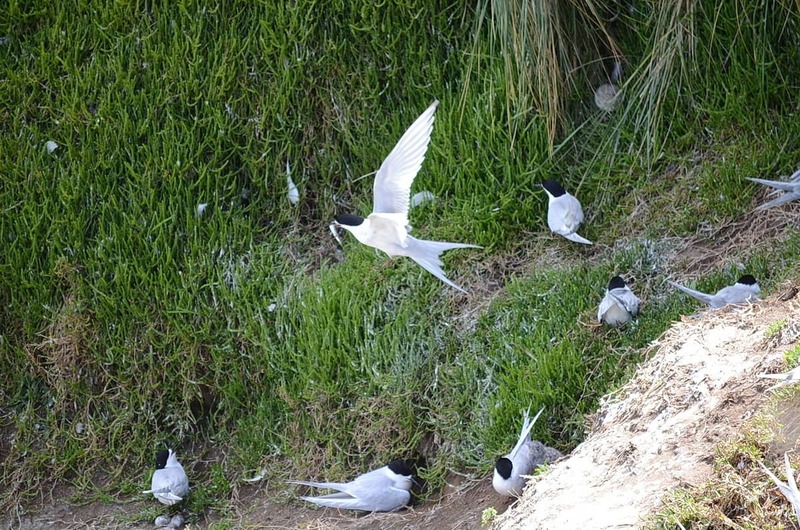 There was a constant flow of White-fronted Terns coming to and going from the rookery. whereas those with chicks to feed were kept busy providing nourishment for the babies. 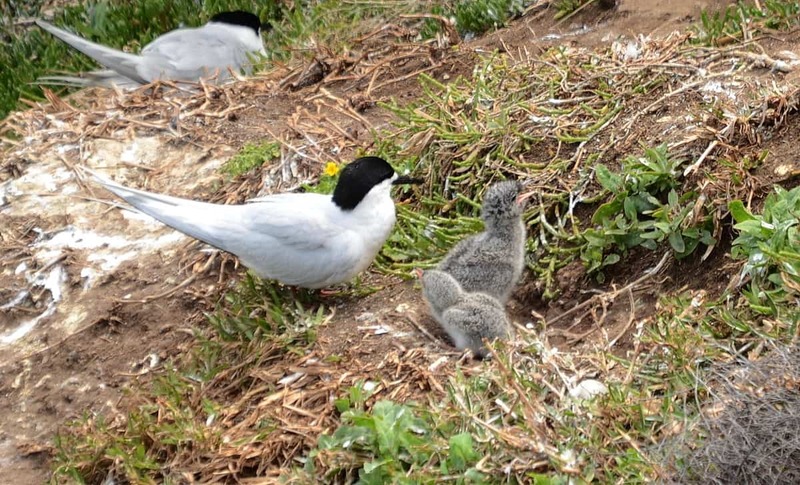 A female White-fronted Tern lays one or two greenish-blue eggs with dark spots. 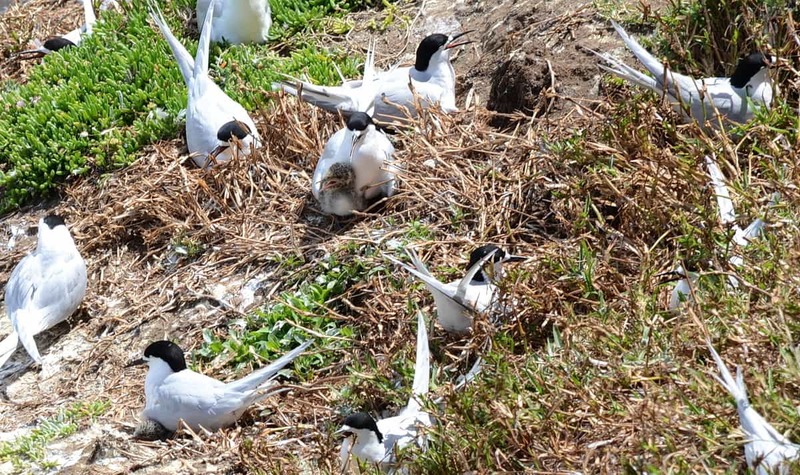 Both the male and female help incubate the eggs over 24 days then continue to share responsibility for feeding the young until the chicks are about three months old. 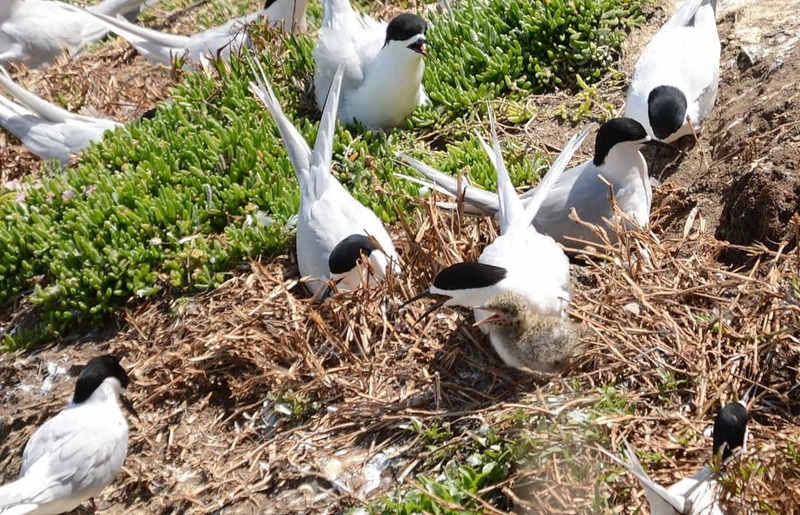 White-fronted Terns put little effort into their nests using simply a shallow scrape in the soil without any nesting materials. 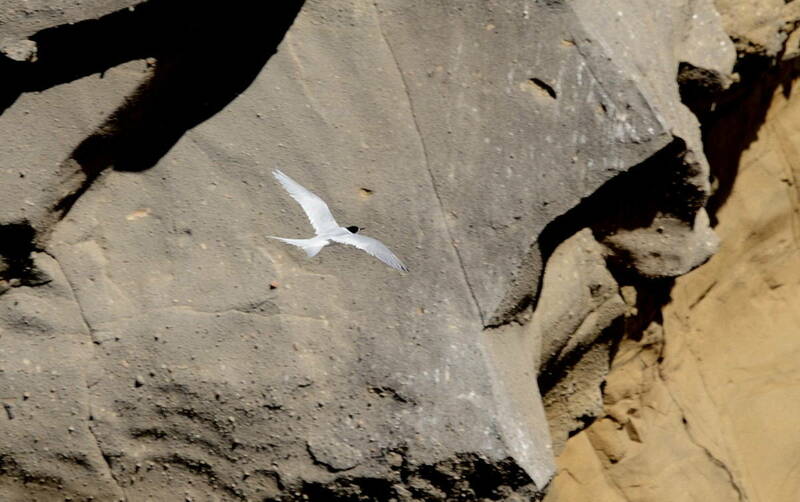 Because of the density of breeding pairs, the nests can be less than a meter apart. 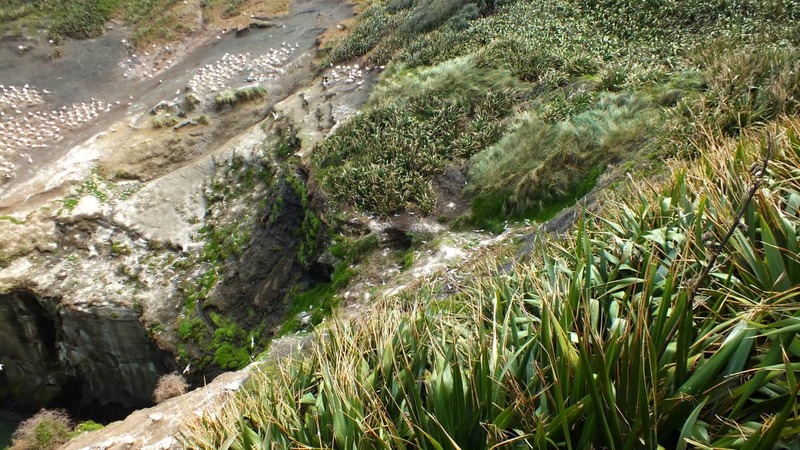 A pair of chicks could be seen in several different nests. 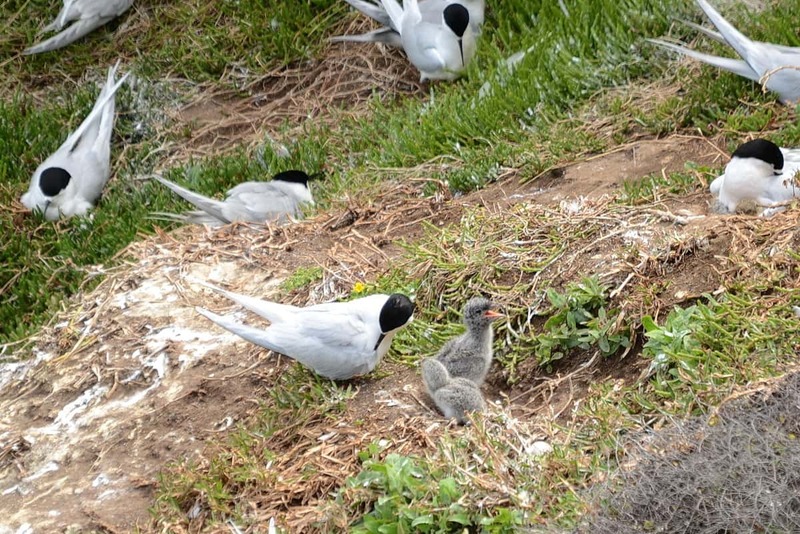 Judging by their appearance, the chicks were only a day or two old because each was covered in whitish down speckled with blackish spots on the head and upper body. 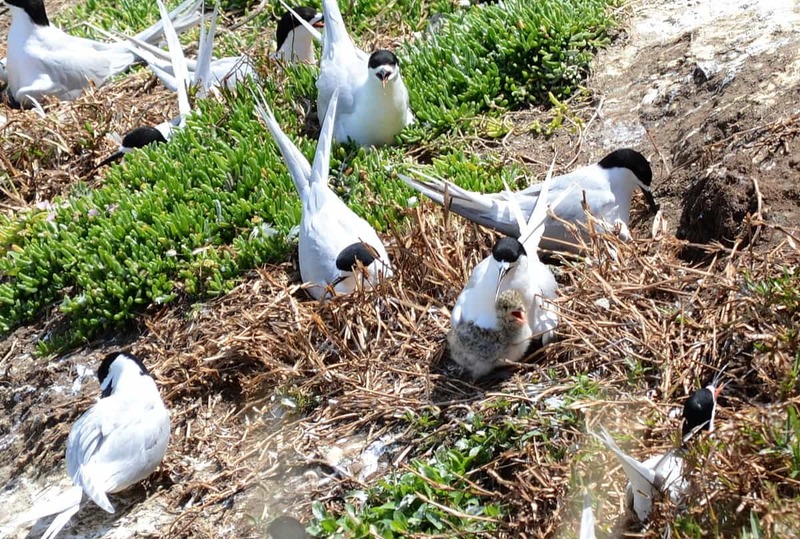 As recent hatchlings, they will remain in their nests for a few days before being shepherded to a crèche. 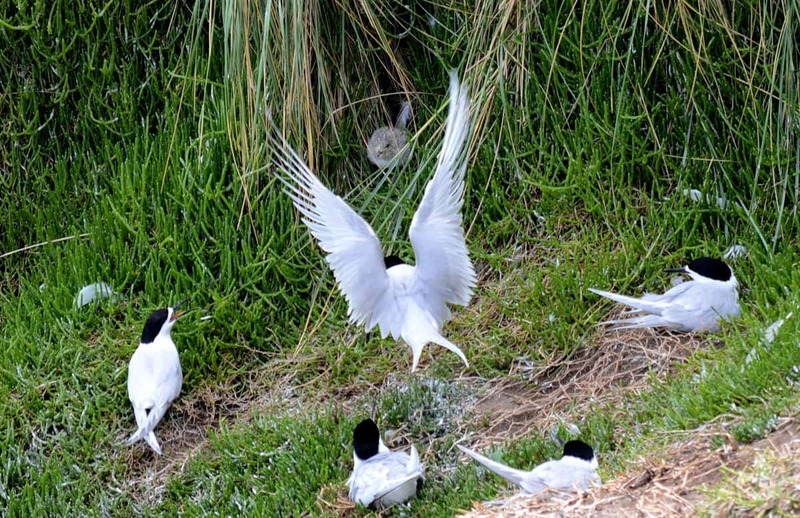 The chicks will remain in that nursery setting while the adult White-fronted Terns go hunting for fish. 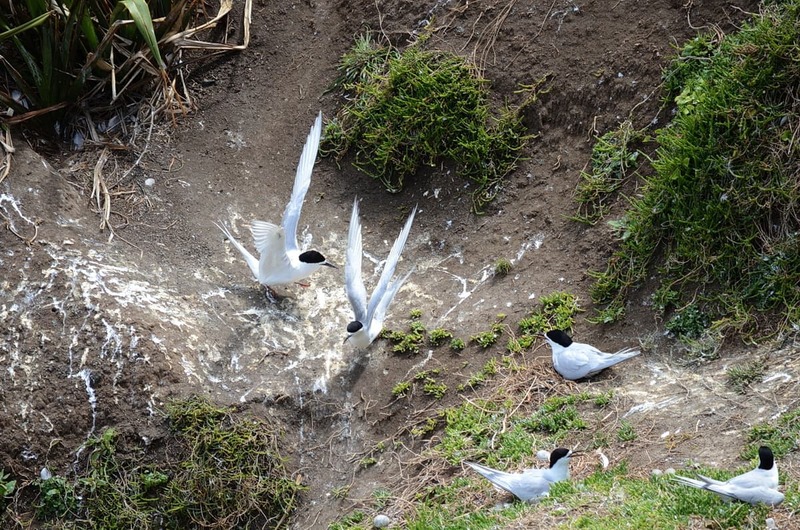 White-fronted Terns are very particular when it comes to their feathers becoming ruffled by the wind. 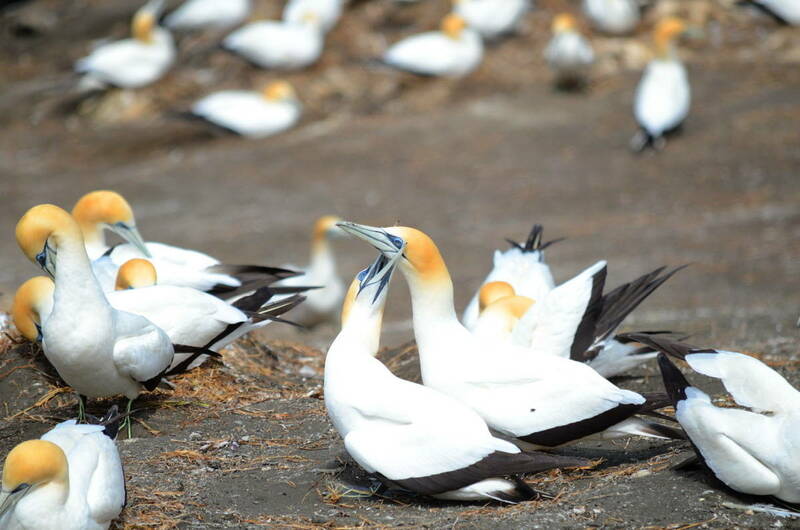 As a result, it is often observed that a colony of these birds will appear very symmetrical with most if not all birds aligned on the same axis against the prevailing winds. 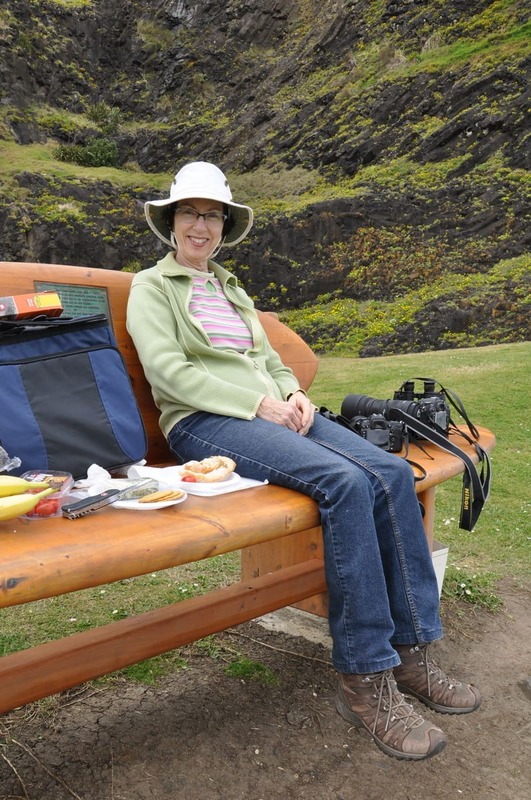 Bob and I made our way back to the parking lot then located a substantial park bench where we could enjoy our picnic. 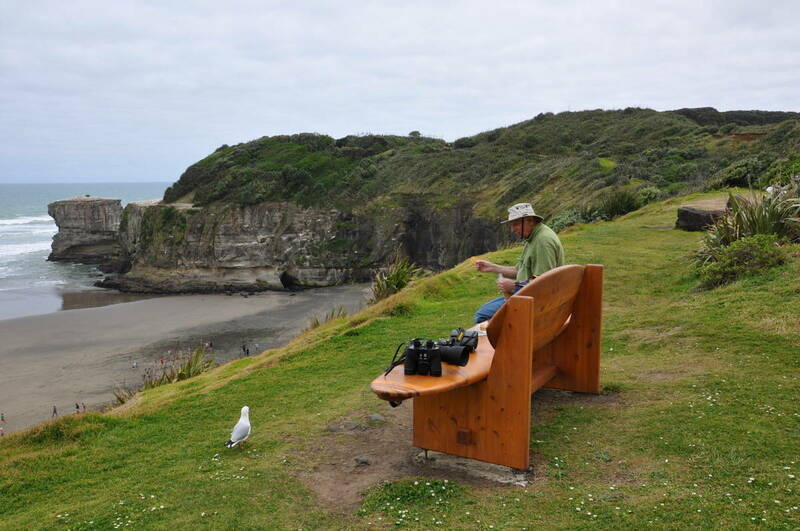 Situated on the cliffs overlooking the black sand beach, the memorial bench was the perfect place from which to watch surfers, beach goers and shorebirds alike.